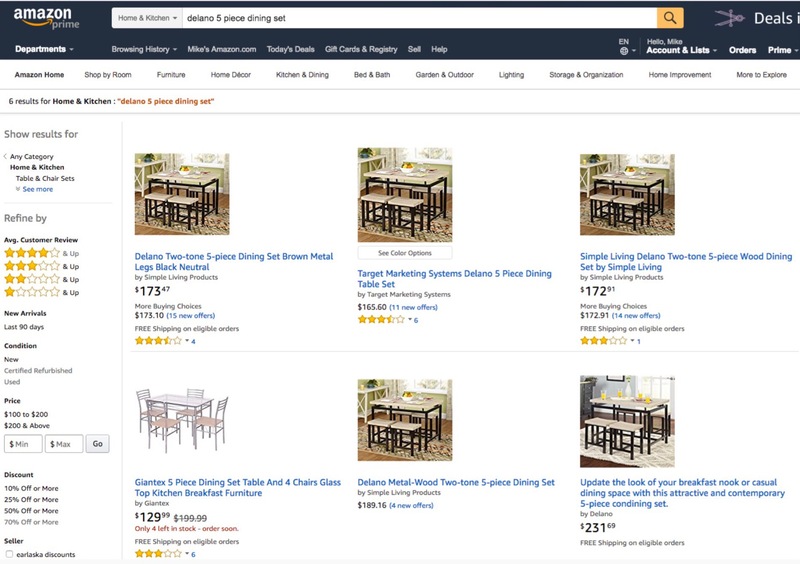 After analyzing a random selection of items on Wayfair, Quartz discovered that the company often lists what appear to be identical products with different prices across its sister sites, often with completely different names. To make matters more confusing, those same pieces of furniture can often be found on completely different websites, like Amazon, or department store sites like Walmart or Sears, with different names again, and different prices. There doesn’t appear to be any rhyme or reason behind Wayfair’s branding and pricing decisions across its companies. Sometimes a product has the same name on different sites, sometimes it does not; sometimes Wayfair is more expensive than its other brands, sometimes it’s the cheapest. A representative for Wayfair told Quartz that each of its brands runs its own independent merchandising and pricing strategy “to create a unique brand experience,” and that things like the average order value or basket size is taken into consideration when pricing goods. ​This smells like an approach that may bring short-term gains but will get you nowhere over the long run. For starters, this only works as long as there are interchangable brand names behind the items. Meaning, people neither search for the brand itself but the generic description and ​nor can they easily compare the items across retailers. ​So, by betting on convenience (which is almost always a good bet) one may maximize, or at least increase, sales across marketplaces and online shops. But the price for that is to never gain any brand recognition. ​Think, on the other hand, about pure online brands. Take, for example, Anker. Anker, through relentless focus on quality and durability became a household name for gadget accessories. This approach allowed Anker to carve out a place for them on top of one of the most ruthless marketplaces in history, without having much of a backing to start with. In a category that is as unsexy and commodity as it gets. They would not have gotten there with a Wayfair approach to ‚branding‘. ​* User reviews get divided amongst the entries. ​* Marketing spend gets complicated. ​* Marketplace search ranking (based on reviews and sales) is being cannibalized by your own product entries. ​Frankly, I‘m a bit puzzled by this strategy. Much like when Quartz uncovered that Amazon sells items from dozens of house brands that it doesn’t make clear are Amazon properties, it’s not always obvious who makes the products customers buy online or where they are produced. In the case of this furniture, it’s likely that many products are available on so many sites because they’re produced by a few low-cost distributors in China or another exporting country and are repurposed for each retailer’s needs. ​* The margins are better. ​But first, that comes at a cost to consumers. Just because a given (online) retailer decides to go sell private label items now doesn‘t mean they suddenly are running factories. The private label phenomenon is a white label phenomenon. Depending on the category, this can mean you as a customer just don‘t get to know anymore who the actual manufacturer is because the retailer slapped their private label onto the product. It is thus not uncommon in retail, both offline and online, that you may find very similar products at different retailers. The product is obviously the same, coming from the same manufacturer. They are just not labeled as such. Private labels at drugstore chains are a perfect example for such a category. ​Amazon Basics products produce some interesting ‚investigative‘ user reviews because of this. ​The bigger picture: Now, put yourself in the shoes of your customers. People can and do talk about your products online. On marketplaces such as the Amazon Marketplace those discussions happen right on your product page. What happens once your customers realize you are ‚playing games‘ with prices and labels? (Maybe you see that differently. What matters is how it is perceived by your customers though.) What happens once they realize you and other retailers have created an almost impenetrable jungle of meaningless labels? ​They get exhausted. And annoyed. ​That‘s the perfect environment for new strong brands to emerge. ​Those brands will use that jungle to their advantage, betting heavily on consumer trust and reliability. They will oversell that. But people will be increasingly hungry for straight-forward ‚trustworthy‘ online brands.